Since I was running all over the Westside yesterday and didn't have time for lunch, I did make a detour for a couple of Tito's Tacos before heading to the Los Angeles Magazine's "The Island Style Cook-Off" in Santa Monica. 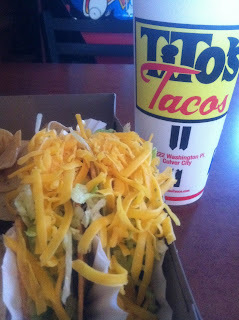 For me, Tito's Tacos has been the same for as long as I can remember, especially after baseball games or basketball practices. The only thing that has changed are the prices and the oil. As many things in life change, some still remain the same. June 28 is National Tapioca Day! I was never really a fan of tapioca pudding growing up, so about 12 years ago when I was introduced to boba and bubble tea, I really wasn't interested in trying it. 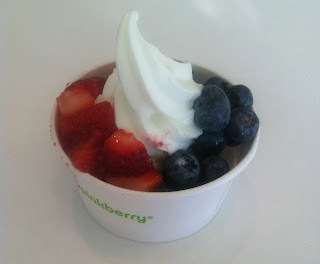 Since boba was explained to me like a soft gummy bear that has a sweet taste, I gave it a try. Tapioca pearls are make from the starch of the cassava root. When cooked, these pearls become a sweet chewy ball with a gummy bear texture. 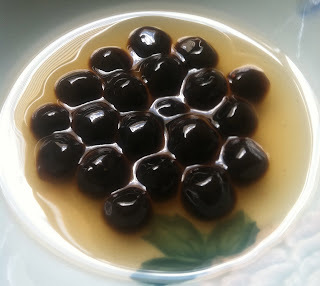 Tapioca pearls or boba are added to various drinks, such as tea, milk, juice, smoothies, and coffee. Can I Please get a Boba Straw? Ramen Monday is upon us again! Last week, it was Kakuni Ramen at Ramen Yamadaya and this week is Foo Foo Tei in Haciendia Heights. Thanks to Keizo (www.goramen.com) who tired all 31 varieties of ramen here, I knew they had something very different than the other ramen shops. I've had about 6 different ones here and do have my favorites. Twitter friend Cat (@thedailydish) mentioned to me last night that she wanted an omelet and that's all that I could think of on my way to Foo Foo Tei. I remembered that they had a crab omelet ramen, but couldn't remember the name, until I saw it on the menu. BTW, the ramen is listed on the backside of the menu. I got here just as they opened for lunch and sat at a table right away. By the time I left, 30 minutes later, there were 11 people waiting. Being in the industry, I often visit the fish wholesalers to either purchase items or to stay on top of what what's in season. I don't usually don't find crab or lobsters this large for restaurants. Not many people can finish off a 4 lb lobster themselves, but family style, the larger the better. Lobster with Ginger and Green Onions Order it with noodles Very Good! The seafood was reasonably priced and very tasty, I'll be back. This was a nice way to close out June's National Seafood Month! BTW, not sure why, but August is also National Seafood Month. Go figure... It just gives me more of an opportunity to talk about seafood. 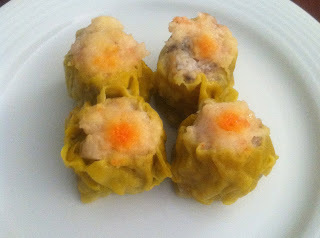 Dim sum translates something close to "touch the heart" but for me it's tea with breakfast or lunch. Having a variety of different choices is always a favorite of mine, love Spanish Tapas too. The variety of dishes range from steamed, baked, and fried or what I call the major food groups. I'm joking, so please no letters. It's the Last Fryday in June! My dad is visiting me this weekend, actually he's in town to take care of some business. One of our family's favorite places is In-N-Out and I knew he would want one for lunch today. So ends another Fryday, the last one in June 2011. It's a different world now...I was talking to a former classmate who's daughter graduates from high school this year. We were talking about starting a new chapter after we graduated. I was telling him that when we were in school, it was all about what we knew. Then in our professional lives, it wasn't what you knew, it was who you knew. Today, it's who thinks they know you, thanks to the Internet. I remember when you could only buy computers from Computerland or Businessland. These retailers only catered to the computer science types and the novices, like me, were out of luck. Ten years ago, Apple would change the way we shopped for computers, it's a different mindset. Rather than sell computers, they sold the Apple brand. 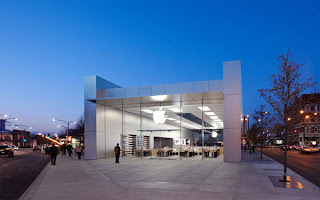 Exercise: Go to an Apple Store and play with the macs, iPads, iPods, iPhones, and MacBooks. See how long it takes before they ask you to move along? 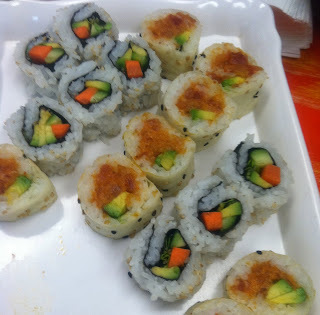 Sushi Chef Institute celebrated the opening of their new location in grand style and I was invited. Andy Matusda, my sensei (teacher) who taught me sushi 11 years ago, welcomed guests to their new home, which happens to be across the street from the American Honda Motor Company headquarters. What's a Sushi Event without Nigiri Sushi? What's a Celebration without Taiko Drums? June 22nd is National Chocolate Eclair Day! I was at the bakery last week and overheard someone say, "What's an eclair? A donut, right?" Happy National Chocolate Eclair Day! 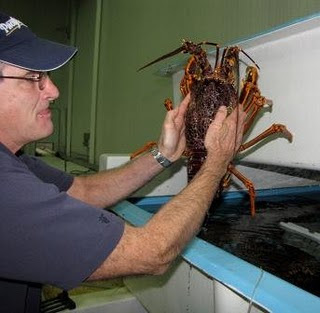 June 15th is National Lobster Day! No matter if they're boiled, steamed, grilled, or baked, if you love them, then today is your day to celebrate. Having been up to Maine, love' em with drawn butter and in rolls. June 14th is United States Flag Day! Here in Los Angeles, we have two originals that have been a worldwide sensation for over 20 years. Not many people know this, but the California Roll and Spicy Tuna didn't come from Japan, they're native to the Los Angeles area. 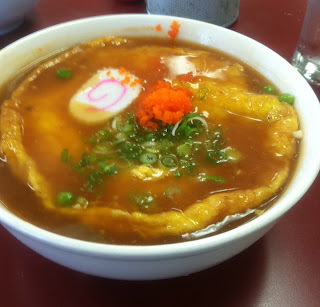 Last week, I was in the South Bay and we had lunch at Ramen Yamadaya (Ramen Monday - June 6th). It was a good place and I'll probably go back there. Ramen Yamadaya's speciality is Tonkotsu based ramen. Tonkotsu is a rich pork bone broth that has a cloudy white broth. By simmering the pork bones for hours, pulls out flavor and collagen, giving it the rich and creamy look. I probably shouldn't say this, but many restaurants add amounts of cream or butter to enhance the broth. Have to admit, Ramen Yamadaya has a better Tonkotsu broth than what I had today. As I was passing another ramen place, I thought to give it a shot. In my opinion, there is one fried food that is very hard to find these days. Tempura is a dying art and not many places know how to do it the old skool way. When I was growing up, restaurants did a great job, nice and crispy. So, I'm happy when I find that does it crispy and not greasy. 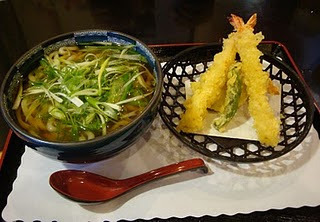 Sanuki No Sato is a place that does a good job with tempura, the udon ain't bad either. On this day, I celebrated with a bowl of udon. Had a meeting in the South Bay today and we ended up at Ramen Yamadaya, so I celebrated Ramen Monday. The specialty here is a Tonkotsu broth, a rich flavored pork broth, which they extract the flavor out of the pork bones. 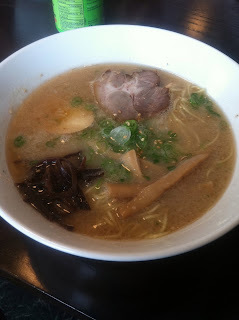 All of their ramen offerings stem from this pork broth, with a choice of thin or thick noodles. I did enjoy it and will be back. Found out they're opening a location in Culver City, will have to check it out.